While most trees are somewhat difficult to start from a starter branch or a cutting, a soft wood birch cutting has a better than 50 percent chance of starting if the starter branch is potted quickly and kept moist. Soft wood cuttings are taken from the tips of stems from the current year's growth. Branches should still be green and flexible, with some mature leaves and some young leaves closer to the tip. Take cuttings that are approximately 6 to 8 inches long and cut approximately 1/4 inch below a leaf node. Use a sharp knife or pruning shears to cut approximately 6 to 8 inches off the end of a new-growth branch that is still green and flexible. Make your cut just below a leaf node and remove all leaves from the lower 3 inches of the cutting. Fill a growing pot (with a drain hole) with a 50/50 mixture of peat moss and sand. Moisten with water. Pour a small amount of rooting hormone into a small container and dip the bottom 3 inches of your cutting into the hormone. Discard any leftover hormone. Make a 3-inch-deep hole in the soil of your growing pot with your finger or a pencil and insert the bottom 3 inches of the cutting into the hole. Gently press the soil around the cutting. Spray the cutting and the soil with your misting bottle and then insert the growing pot into a plastic bag, which will act as a mini "greenhouse." Place your growing pot in a well-lit location out of direct sun, where it can be kept at a constant temperature of 65 to 75 degrees F. Do not place your "greenhouse" in direct sun. Allow to grow indoors for eight weeks. Prepare a sunny place in your garden to transplant your birch cutting. Dig a hole 12 inches deep and 24 inches in diameter. Fill the hole with a mixture of one-third garden soil, one-third sand and one-third peat moss. Make a small hole and carefully place your 8-week-old cutting with its roots into the hole. Gently press soil around the cutting, being careful not to break any of the tender roots. Water to dampen the soil, but do not soak the ground. Keep the soil damp but not overly wet as your birch continues to grow. 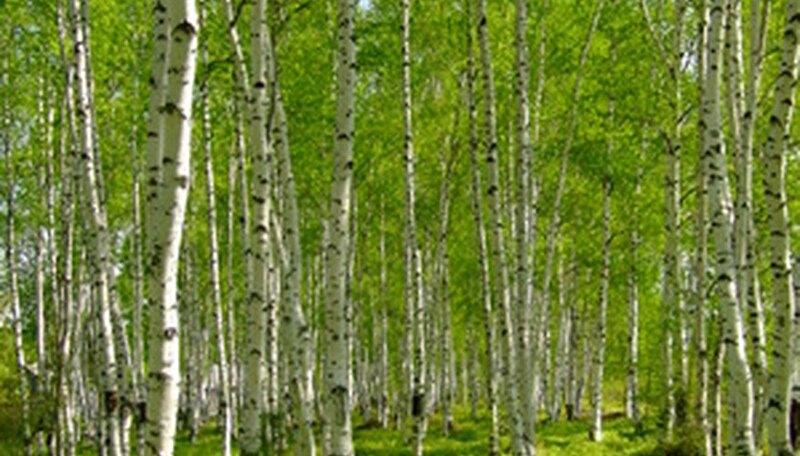 Do not fertilize until your birch has been growing in your garden for at least eight weeks. Keep all cuttings moist before planting. Place in a baggie with damp paper towels if they will not be planted right away.